Volunteering can be immensely satisfying and rewarding, and should you decide to support Daybreak in this way, we will strive to help you get the most out of your role. There are several ways in which volunteers can help Daybreak, and all are vitally important to the continued success of the organisation. 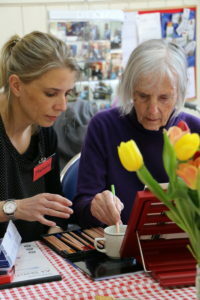 Some volunteers who have an interest in helping people with dementia have fun whilst attending one of our Clubs. You will work alongside our experienced staff, and training and support will be given. Your interests, experience and general skills could be a most valued contribution. If you have musical or singing ability, or a particular hobby or interest that members may enjoy, please let us know. But just your enthusiasm, understanding and care can provide vital help with our Club members. You must be aged 18 or over. You can stay as long as you like, and attend as regularly as you like. All that we ask is that you are friendly and reliable. To apply, send a brief outline of why you would like to volunteer, your background and any particular interests you feel might be relevant, plus contact details for two referees to our Director, Andy Buckland: director@daybreak-oxford.org.uk or by post to our main office (see Contacts page). 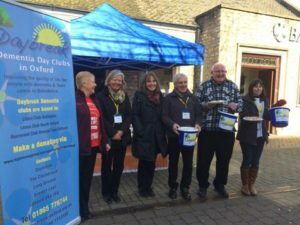 We welcome support from volunteers at our various fundraising events, and more information is available about these in News & Events. Sometimes we need help with public collections, or with information stands promoting Daybreak services (just an hour or two, at a time convenient to you). Also, as a small organisation, we very much value extra help with certain administrative roles, such as mailings, cash counting, and particularly with IT and digital media. If you have experience in any of these areas, and would be able to give some time, please get in touch. We are always looking for people who are prepared to become Trustees of Daybreak Oxford. The commitment is to attend four trustees meetings each year,and you may also be interested in taking on some special responsibilities, such as becoming an officer (Chair, Treasurer or Secretary) or taking part in a special project. If you are interested in becoming a Trustee of Daybreak and you have skills which you think would be helpful to Daybreak and the Board please contact the Secretary for further information, email: secretary@daybreak-oxford.org.uk. Our document Becoming a Trustee of Daybreak Oxford summarises the general responsibilities and the contribution that Trustees can make.